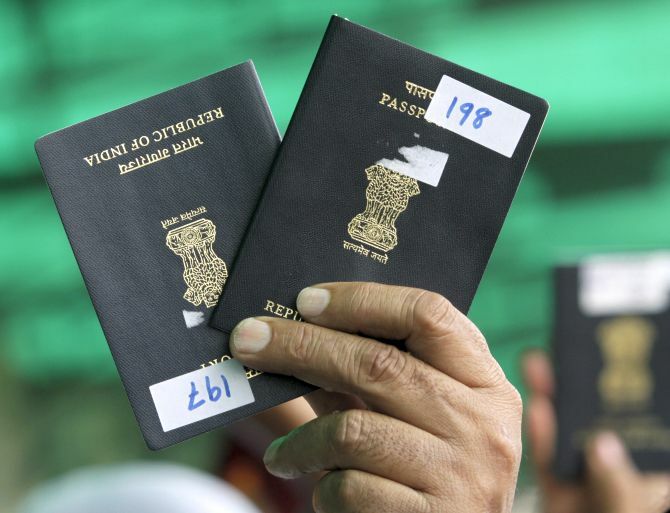 Rediff.com » Business » Why are our passports so shabby? 'Why can't a country that builds and manages airports of acknowledged excellence at home and abroad produce passports of durable quality for its citizens?' asks Sunil Sethi. Indian travellers to Bali are suitably proud to learn that its sophisticated new airport, with its seamless organisation, rated as one of the best in the world for handling 15 to 25 million passengers annually, is built and managed by the GVK-led consortium, which redeveloped and runs Mumbai's international airport. GVK is also upgrading or establishing several airports throughout Indonesia, especially at key tourism hubs. But pride, as they say, comes before a fall. Two Indian passengers (one known well to me), just ahead in the immigration departure queue at Bali some days ago, were pulled out by officials for special scrutiny. Sheepishly they reappeared some minutes later with coincidentally the same problem. Their passports, both of relatively recent issue, were found to be falling apart at the seams. "It is a common problem with Indian visitors," the immigration officer explained politely. "Please go back and report to your government about the poor quality of passports." In addition, he pointed out that the ink on identity markers smudged so easily it failed to register on computer terminals. "In many places these would count as damaged or suspicious travel documents," he said. Some days later, after a replacement passport was issued at home, the local constable confirming an address check, endorsed Indonesian immigration's opinion. "Just see for yourself how badly bound and printed Indian passports are." He regularly encountered similar complaints on his beat. It is just one of many contradictions that retards Indian tourism, both outgoing and inbound: Why can't a country that builds and manages airports of acknowledged excellence at home and abroad produce passports of durable quality for its citizens? Indonesia is one of 50-odd countries that issues tourist visas on arrival for $20 to Indians but lately even that fee has been abolished. India, meanwhile, has just jacked up its visa-on-arrival fees from $50 to $80 (and from $75 to $100 for US and British citizens) to universal condemnation by the tourism trade who were not consulted. "How will we double tourist arrivals if we hike visa rates? We are killing the goose that lays golden eggs?” asked Subhash Goyal, chairman, Assocham Tourism & Hospitality Council. Like many Southeast Asian countries freeing up financial controls to bolster tourism, visitors to Indonesia can freely bring in up to $75,000. In India the limit is $5,000, beyond which, be prepared for declaration forms and paperwork. Bali is just one of a long string of 13,500 islands that make up the longest archipelago in the world. Predominantly Hindu, traditionally hospitable, and about less than double the size of Goa, the occasional volcanic eruptions of Mt Agung have not diluted its galloping growth as the reigning star of Asian tourism. Last year Bali was named by TripAdvisor as the world's top destination in its Traveller's Choice award. This little dot on the map drew nearly 6 million tourists in 2017 as compared to 10.18 million for all of India. As a periodic visitor over the last decade I have seen the change: Bali is cleaner, with superior roads and services, and far better value for money -- across a spectrum of budgets -- than any leading tourist destination in India. Goa's recently refurbished airport is shambolic compared to the smooth well-oiled machine of Denpasar. For many Australians (but also well-heeled Japanese) Bali is the perfect escape from arctic Antipodean summers. Some of the world's leading architects and designers work or live here so the innumerable villa rentals are of pared-down minimalism in contrast to the profuse decoration of flower-decked votive Balinese shrines and temple architecture. It is true that the commercial neon strips of Kuta and Ubud can get as raucous and fumed-choked as Calangute-Candolim in Goa; but in seven days we were only bothered once by an unsolicited guide. No provincial museum in India compares with the display and organisation of the one at Nusa Dua. In comparison a two-day road trip from Goa to Hampi not long ago was a hallucination of potholed roads, crummy overnight stay at the magnificent site of Badami, encroached temples at Aihole, and the filthiest public toilets at Hampi. As for the Taj Mahal's precipitous decline, the Supreme Court's ongoing harangue is a shout in the dark. Because there is no competitive edge among states to attract foreign tourists -- even though tourism overall contributes 6.23% of GDP -- travellers to India are broadly slotted either as luxury high net worth individuals or moth-eaten hippies. Despite India's embarrassment of riches there is abject lack infrastructure and basic amenities to satisfy a vast middle segment of tourists. Modesty is not a virtue prized by Indian policymakers. Unlike our unaccountable, inefficient (but often-self-aggrandising) politicians and officials, Indonesia's Tourism Minister Arief Yahya sounded half-apologetic in the Jakarta Post the other day, saying that Bali was a long way from realising its potential, when Bangkok alone welcomes 18 million tourists a year. He hoped Bali would soon beat Malaysia and Thailand. India, on the other hand, analysts say, will count its blessings if it touches the 15 million figure in 2025.